Many parents are guilty of putting their children on a pedestal. L and I do not make this mistake. 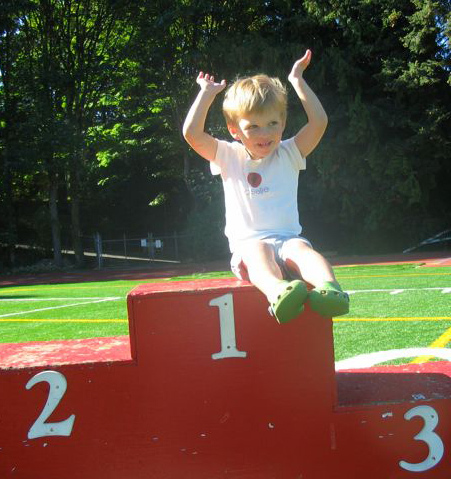 As competitive runners, we use a podium instead. Phil’s behavior occasionally justifies our boundless faith in him. The other day, we were walking down the sidewalk when I pointed out a truck that was approaching. I had never thought about the distinction before, but he’s right. A Jeep is not a truck. Way to shift that brain into high gear, Phil! Hey, strangely enough, I decided to google Scott Becker's name and see if anything he had written came up. He was my friend/classmate in the PhD program at Fuller. Anyway, thanks for writing the blog entry about him. (My professor is working currently on finishing Scott's dissertation so it can be published). Email me sometime and I can put him in touch with you.